Leading global beauty brand L’Oréal Paris undertook a diversity of digital activities at the recently concluded PFDC L’Oréal Paris Bridal Week 2014 (PLBW2014) to enhance the digital experience of the bridal fashion showcase. By integrating different social media initiatives physically on-ground and online, the brand endeavoured to enhance the accessibility of PLBW 2014, especially for those experiencing the best of Pakistani bridal fashion, make-up and styling from the comfort of their own homes. In a first for local fashion events, L’Oréal Paris introduced Pakistan’s largest Social Media Wall at the PLBW 2014 venue, where guests at the event could stay up-to-date regarding live tweets, Instagram images, Facebook posts and other social media activity regarding PLBW 2014. 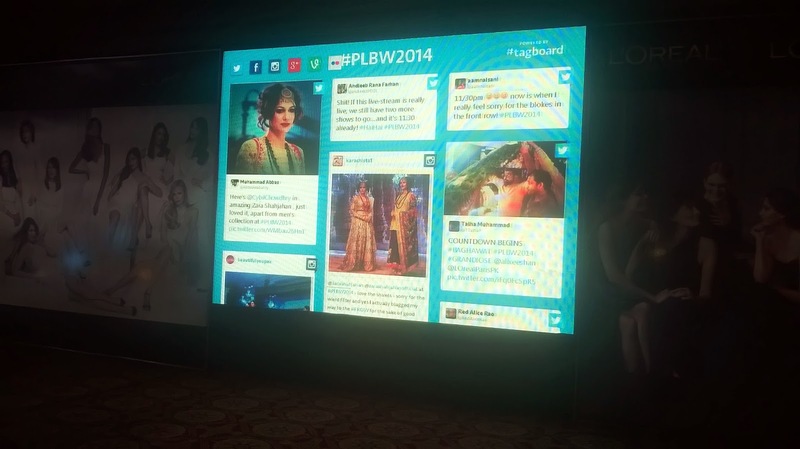 The Social Media Wall at the main exhibition area of the venue showcased content from the PLBW ramp, backstage, Black Carpet and main exhibition area wherever the event’s official hashtag #PLBW2014 was used online. The live screen was updated in real time, ensuring that enthusiasts following the event always had access to the newest and freshest content regarding the platform being shared through social media. L’Oréal Paris also introduced a personalized e-commerce website, “Shop the Look” where patrons could view and purchase products from the complete L’Oréal Paris beauty portfolio used to create the unique make-up and styling looks showcased at PLBW 2014. The brand also digitized and made available for download e-versions of their signature INSIDE Bridal Week newsletters which were traditionally distributed during each day of PLBW. The electronic copies of the newsletter also included custom content pertaining to “Bridal Season Hair styles”, which highlighted three trendy looks for this bridal season designed by leading stylist Nabila using L’Oreal Paris Extraordinary Oils, The Total Repair-5 Serum and the Excellence Wild Ombrés hair color range. As global leader in innovation in beauty, L’Oréal Paris look forward to further bridging the gap between the runway and retail through further innovations in non-traditional media and digital communication.